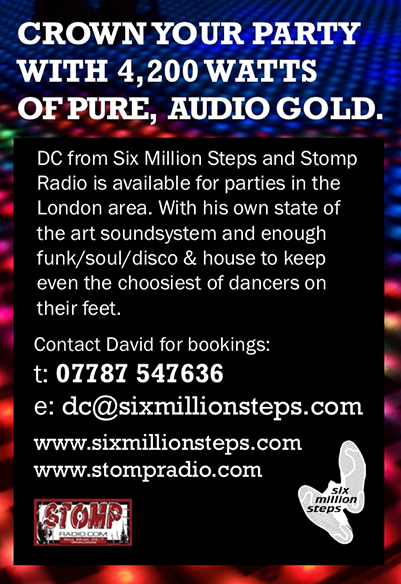 Six Million Steps are a London-based collective of DJs, record collectors, and enthusiasts of soulful black music. We specialise in presenting radio shows, producing mixes, and occasionally hosting club events. We've now been working together for over ten years, and are still as enthusiastic and passionate about what we do. Our name is borrowed from a 1978 jazz funk record by Rahni Harris - 'Six Million Steps (West Runs South)' which commemorated a 2,500 mile charity run along the length of the US east coast by athlete Andy West in aid of Muscular Dystrophy. You can find out about the Six Million Steps team members here, via our individual biographies.